5 Life Coaching Myths | Be "Noticed"
You may have heard of a life coach, and might want to consider getting one for yourself. Many people have gotten strong benefits out of working with a life coach, and find them essential to handing things like setting goals, improving a work-life balance, and becoming a happier person. But there are also some myths about what a life coach is – and what a life coach is not. 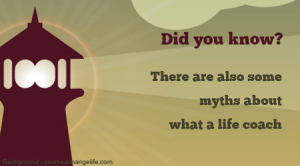 Here are the some of the most common life coaching myths, according to MeredithHaberfeld.com, a life coaching company. Some people think that life coaching is quackery, designed merely to separate you from your money. . While there may be some life coaches not worth seeing, like there is with every profession, the fact is that there are many great life coaches out there who can help you live the life you imagine. You should check out a potential life coach, and then see if you have a good rapport with the person. A therapist –such as a psychologist or psychiatrist – has an advanced degree (an M.D., in the case of a psychiatrist) and works on people with psychological problems, or some form of mental illness. While you can gain great benefits in your life by seeing either a life coach or a therapist, generally speaking, a life coach can help you with things like goal-setting, work-life balance, or seeking happiness, while a therapist can deal with more deep-seated psychological issues. What a life coach does is not really the same thing as what a friend does. With friends, there is give and take, shared interests, and activities done together. With a life coach, it is all about you. You talk with the coach about what goals you want to achieve, whether it be losing weight, communicating better, finding a romantic partner, or some other goal. The conversation will all be based on what you want to do. While a life coaching expert can have a friendly way with you, keep in mind that the person is a paid professional out to help you achieve your goals. Some people are afraid of life coaching because they worry that they are going to be going to sessions for the rest of their life before getting results. The truth is that you can start seeing the benefits from life coaching in as little as just one session, and with five or ten sessions, you can see some major benefits. The ultimate number of sessions you may need is up to you, but it will not be a lifelong commitment, to be sure. While there are indeed some life coaches who cater to VIPs and charge fees accordingly, the reality is that you can find a life coach who can potentially fit your needs, no matter what your income level. So you do not need to feel that getting a life coach is a far-off goal. Just the opposite, in fact. So why not look for a life coach today? Lisa Swan writes for a variety of blogs.